Rehearsal Thursday evenings 7:30 – 8:30 PM in the Music Room. The Chancel Choir leads the Sunday morning worship most weeks. The Chancel choir is an adult group (college age and up). Rehearsal Tuesday evenings 7:00 – 8:30 PM, as called, in the Music Room under the direction of Mary Westervelt. The Praise Band leads worship every 4 to 6 weeks with contemporary praise music. The band consists of vocals, keyboard, guitars, drums, and flute. Free Concerts featuring the best music from touring artists and bands. 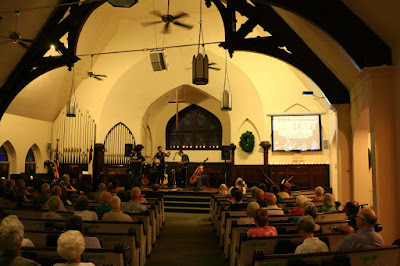 Concerts are held in the church sanctuary and open to the public. Craig Bickhardt, Thom Schuyler, and Sylvia with John Mock on Saturday April 13th at 7:00 PM. You will be moved by all four performers, knocked out by their musicianship, All are welcome to join us for the FREE Concert.